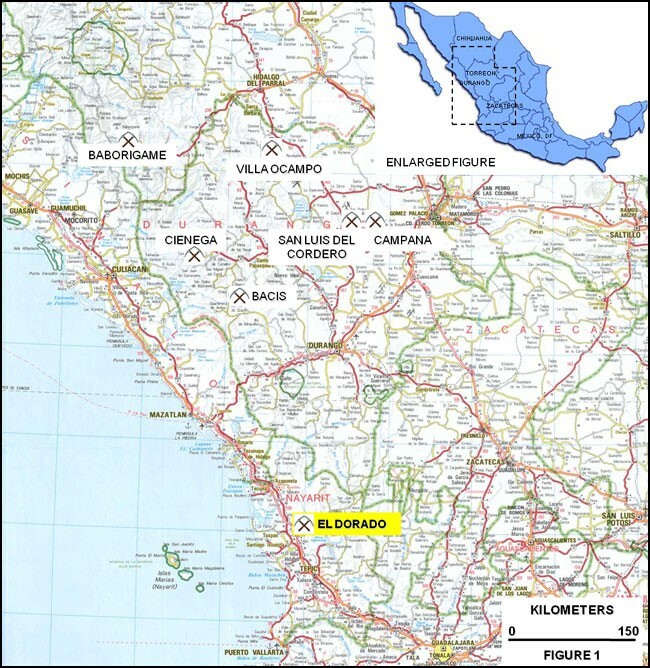 The El Dorado Gold-Silver Project is located near the village of Las Minitas, State of Nayarit, 50 kilometers south of the SDA Processing P The project has excellent road and rail infrastructure. The El Dorado Mining Concession consists of a 50-hectare concession valid until March 2030. Magellan holds the concession under an option to purchase. Magellan intends to advance El Dorado towards production as a matter of priority. The mineralized material would be trucked to the SDA Plant for processing. The Company has initiated permitting and has obtained quotes from underground mining contractors. Commencement of mining will depend on obtaining environmental and blasting permits, selecting and mobilizing a mining contractor and procuring financing. An access and land use agreement with the local ejido (land owners) already is in place. Once underground development begins, mineralized material will be sourced initially from the shallow, upper portions of the mineralized veins. The principal vein system is the El Dorado epithermal vein trend that strikes N50°E and dips steeply to the northwest. It forms a continuous reef outcrop 1.5 kilometers in length. Additional discontinuous outcrops both to the northeast and southwest indicate a strike length of 3.5 kilometers. The El Dorado Vein exhibits potential to contain multiple mineralized zones, including higher grade over minable widths for underground mining, or lower-grade open pitable stockwork zones which are observed over tens of meters in width in both the hangingwall and footwall of the El Dorado vein system. 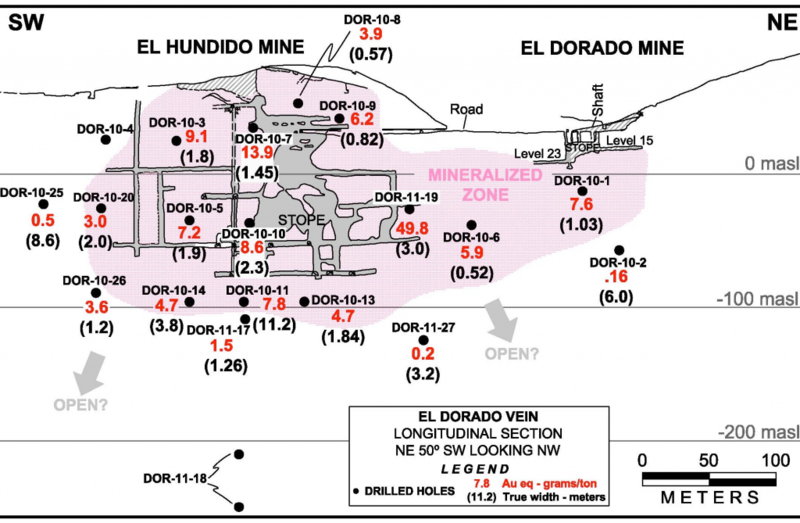 The El Dorado vein system has a history of small-scale mining. In the period 1900-1927 a mineralized zone was mined in the Hundido Mine where an estimated 50,000 tons of high-grade ore were extracted. The El Dorado Mine, 250 meters northeast of Hundido Mine, was subsequently developed and mined intermittently from 1965-1990. Drilling on the El Dorado vein system in 2010-2011 comprised 28 diamond core holes totaling 4,950 meters. The drilling intersected multiple steeply-dipping silicified mineralized zones extending from near-surface to a drilled depth of 150 meters. Mineralization is partly open below 150 meters depth. Notes: 1. Polygonal resources based on intersections from 10 holes. Tonnage reduced by 25% to allow for mining dilution and recovery loss. Does not constitute ore reserves under SEC Industry Guide 7.